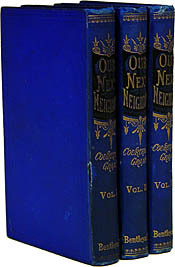 Constance Blount wrote five novels, of which Our Next Neighbour was the third. 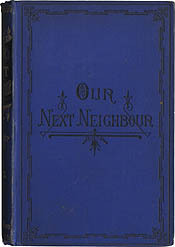 In Blounts first letter she expresses her delight with the cover design of her novel Our Next Neighbour, and its binding ("I think I never saw any novel so smart before..."). About the book she observes: "I did not intend to be half so hard on the half-educated as on the upper classes, but in exposing... the sins of the latter, one c'd not... refrain from showing the more ridiculous & disagreeable but less serious faults of those supposed to be below them." Her second letter deals with the growing disagreement between Bentleys and Clowes & Clowes, the firm that printed Our Next Neighbour. 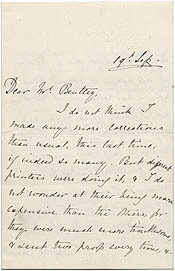 Bentley is not happy with the price the printers have charged for making author's corrections. She complains about Clowes: "I do not wonder at their being more expensive than the others [printers], for they were much more troublesome." She argues that she did not make many changes and as she used to print herself, she was "very careful not to give trouble." [top] Courteney Grant. Our Next Neighbour. London: Richard Bentley and Son, 1876. 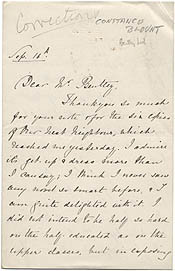 [bottom] Two autograph letters addressed to George Bentley. September, .